Photo courtesy of Fulton Commons. Brothers Brian and Irwin Mendelssohn aren’t artists or chefs. But they’re in the business of making things from scratch. The principals of Botero Development, a local firm focused on residential, retail, office and mixed-use projects, are creating a kitchen incubator-artist studio-coworking space on Pittsburgh’s North Side. Last year, they bought the Saint Joseph School on Fulton Street in Manchester and began gutting the 18,800-square-foot building. When it opens in late August, Fulton Commons will provide food companies with unlimited access to commercial kitchen equipment. It will also give artists room to create and offer communal work areas, conference rooms and private offices for freelancers and startups. About 150 memberships for Fulton Commons will be available, including 30 kitchen spots (starting at $650 per month) and 15 artist workshops (starting at $350 per month). Coworking users will pay between $125 to $400 per month, depending on the accommodations they need. In addition to physical space, all members will receive business planning guidance. “And they’ll enjoy going to work,” Irwin Mendelssohn says. Right now it’s just stud walls and dusty floors. But by the end of the summer, this should be a site mixing old-school charm with modern amenities. The original structure was built in the 1940s and, until recently, served as the Western Pennsylvania headquarters of the Society of St. Vincent de Paul. Thanks to dozens of large windows, both floors are bathed in natural light. The basement kitchen is equipped with prep tables, storage space and new appliances including a walk-in freezer. The main floor coworking area will be separated into different sections the Mendelssohns describe as “neighborhoods,” each with its own decor and storefront-style entrance. 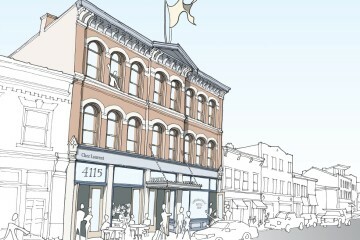 The Mendelssohns also envision a café area where on-site food purveyors and craftspeople can sell their wares. The pair researched similar facilities across the country and combined that knowledge with their own business experience. They believe Pittsburgh needs this kind of three-tiered space due to its growing restaurant industry and art scene, along with the trend toward flexible work spaces. Brian Mendelssohn, founder of Row House Cinema and Bierport in Lawrenceville, says Fulton Commons aims to benefit its members and its neighbors. There will be farmers markets, festivals, workshops and other public events held in the plaza next door.